Product prices and availability are accurate as of 2019-04-18 16:02:12 UTC and are subject to change. Any price and availability information displayed on http://www.amazon.co.uk/ at the time of purchase will apply to the purchase of this product. Well known broadcaster, ERIC ROBSON joins the master fellwalker, ALFRED WAINWRIGHT, in this classic BBC series and shares the highlights of his 190 mile walk from the Irish Sea at St. Bees Head in the Lake District to Robin Hood's Bay on the North Yorkshire coast. 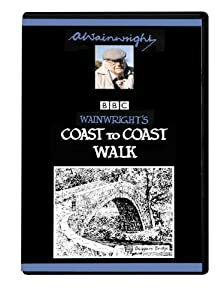 The COAST TO COAST WALK long distance route was devised by Wainwright in 1972 and traversed what AW described as "the grandest territory in the North of England". The walk passes through some of the most beautiful and varied scenery in the country. Two thirds of the route lie within three contrasting National Parks: the rugged mountains and beautiful lakes of the Lake District, the rolling hills and pretty valleys of the Yorkshire Dales and the expansive heather moorland of the North York Moors, with dramatic coastal scenery at each end. Good conversation, fabulous countryside and great walking. A perfect gift. Secure your purchase by clicking the shopping basket button at the top right of the screen now. ERIC ROBSON has produced award winning hill walking television programmes including The Wainwright Memorial Walk and Wainwright's Remote Lakeland under the umbrella of STRIDING EDGE PRODUCTIONS whose comprehensive range of DVDs of walking in the beautiful countryside in Britain are hugely popular. Eric's day job is being Chairman of the world's longest running broadcast programme "Gardener's Question Time" on Radio 4 and he is Chairman of Cumbria Tourism. He is also the author of books such as After Wainwright and The Border Line.